By Jaime Friedman, M.D., F.A.A.P. Obesity in children and adolescents is an ongoing problem in the United States. Several major national and international organizations have concluded that added sugar in the diet is contributing to obesity and the health risks related to obesity. Children and teens report, on average, getting 17% of calories from added sugar, half of which comes from beverages like juice, soda and sports drinks. Consuming these beverages increases the risk of heart disease, high blood pressure, and diabetes. Because sugary beverages have limited to no nutrition, the American Academy of Pediatrics has concluded that reducing these beverages in the American diet will overall reduce sugar intake and improve health outcomes. While they have already made recommendations on reducing juice intake, the AAP is now recommending policy changes to further reduce consumption of sugary drinks. Increase the price of sugary drinks, such as an excise tax. Use tax revenues to reduce health and socioeconomic disparities. This has shown to be effective in other countries and parts of the United States. Government should support efforts to decrease sugary drink marketing to children and adolescents. Children are more likely to consume beverages they see advertised. Nutrition assistance programs to encourage access to healthy food and discourage sugary drinks. This must be done in a way that does not stigmatize participants in the program, especially as some programs don’t have nutritional standards. Readily accessible and credible nutrition information on labels, menus and in advertisements. This includes consumer education on how to read and use nutrition labels. Also, this may include front-of-package labels. Policies that make healthy beverages the default. For example, promoting milk or water with kids’ meals or in vending machines. Hospitals should serve as an example and limit or disincentivize purchase of sugary drinks. This improves the health of hospital employees, as well as raise awareness to the public about the risks of sugary drinks. We know that the development of obesity is multi-factorial. Influences on the development of obesity include “overall nutrition, portion size, physical activity, sleep, screen time and stress”, according to Dr. Muth. However, when it comes to evidence for which factor most impacts health outcomes, sugar is the strongest. “Especially that from sugary drinks.” Therefore, to reduce the risk of harmful health outcomes, whether at a healthy weight or not, sugar reduction remains the most important thing parents can do. 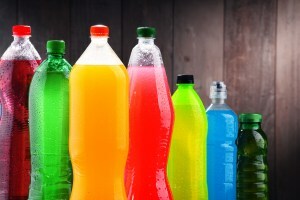 For parents wondering how they can help now, while waiting for policy changes to take place, avoid buying sugary drinks. Dr. Muth says, “sugary drinks include more than just juice, but also include soda, sports drinks, lemonade, Frappuccinos and sweetened coffee drinks.” Don’t forget about smoothies that seem healthy because they are made with fruit but in reality have a lot of added sugar. Children should only consume 25 grams of added sugar per day. Guess how much is in a 20 oz bottle of soda? 65 grams! In general, parents need to be aware of all of the places their children get added sugar in their diet. Beverages may make up half of the sugar children consume, but sugar hides everywhere. As pediatricians, we recommend a diet high in fruits and vegetables and encourage water as the drink of choice. Dr. Friedman has been practicing pediatrics in San Diego for over ten years, initially working at Rady Children’s Hospital in its Urgent Care and then moving to Children’s Primary Care Medical Group in 2004. She is now the lead physician of the new CPCMG 4S Ranch office. Dr. Friedman is Board Certified and a Fellow of the American Academy of Pediatrics. She has been one of San Diego Magazine’s Top Docs for the past 8 years and was elected Best Doctor in East County by The Californian in 2011. Dr. Friedman went to medical school in Baltimore, Maryland, where she grew up, and did her pediatric residency in Portland, Oregon, at Doernbecher Children’s Hospital. She is still a very loyal Baltimore Ravens fan and loves football. On a professional level, Dr. Friedman’s interests include literacy, breastfeeding, and fitness. While at the CPCMG El Cajon office, she started a new Reach Out and Read location,, and is working on providing books for patients at all CPCMG locations. She also plans to organize regular kid-friendly hikes for the 4S Ranch community. Personally, she has walked in three Breast Cancer 3-Day walks, volunteers at her children’s school, and has been active on the PTA. She also volunteers as the camp doctor every summer at Camp Mountain Chai. When she isn’t working, Dr. Friedman enjoys every minute she can with her husband and two children. Together, they love to ride bikes, spend time with friends, and play with their 2 Australian Shepherds, Luna and Lucy.